This Barnyard Puppet Show is perfect for our preschool guests. 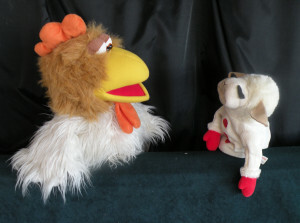 They will enjoy this interactive puppet show about Bob the Rooster that doesn’t know how to crow. Experience barnyard animals, their sounds, sign language and audience participation. Laugh, sing and dance along with this fun show with special guest, Old McDonald! One adult complimentary ticket per groups of 10 students or more.